I really don’t know why I stopped this. I had totally forgotten until a blog reader brought it to my attention. I hope I can keep up this time. A little heads up before I move on. #ThankfulThursday, as the name implies is a day I set a post aside solely for thanksgiving and gratitude. It’s a time I reflect on those seemingly unimportant things that we usually take for granted, most times during the past week. But in this case, over a period of time. 1. Life: There’s so much going on around and it’s only by God’s grace that we’re alive. powers, against the rulers of the darkness of this world, against spiritual wickedness in high places. 3. Provision: God has a way of meeting me at the point of my needs. I’ve learnt to just commit whatever it is into His hands, surrender all and wait patiently. He will do what He alone can do. 4. Patience: One virtue I’ve learnt this year is patience. God taught me how to wait on Him expectantly.Initially I got angry and threw tantrums but somehow, I got over it and just waited. I really didn’t have a choice. That way I don’t have to worry about certain things anymore. 5. New Things: I particularly love that I’m learning, growing whilst at it. I’m creating images for my posts. I’m trying to improve. The truth is I’ve really been lackadiscal about this blog even though I’ve always yearned to make it better. The motivation just never came but I believe things will change soon. 6. 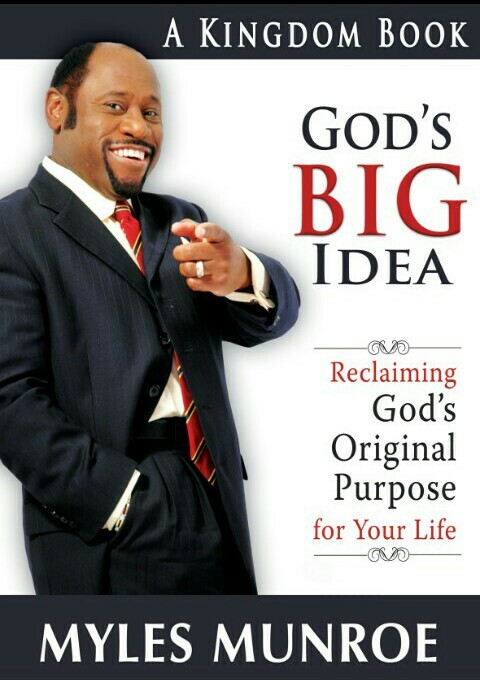 God’s Big Idea: I was extremely saddened, shocked and stunned by the death of Myles Munroe. Still trying to come to terms with it. But this incident made me realise how much influence this man had on my life and I’m just so grateful to have known him in my lifetime. There was a point in my life when Church became a cliché and just needed to find meaning again. But then, I read this book and it’s safe to say that I had a paradigm shift. It was such an amazing experience for me. Sigh. Like we always say, the angels have welcomed another Kingdom citizen. 7. Books: I’ve always loved books for as long as I can remember. Growing up, instead of staying in the kitchen with my mother, I was always reading in my room. I always say that I taught myself how to cook which also explains my aversion for food. Give me books over food any day. But this days, it’s something else especially with the advent of ebooks to someone that’s used to carrying boxes of books around. The craving is uncontrollable! There are so many books to read and so little time. Before the end of the year, I should have read 50 books. 100 next year? Or maybe 75? 8. Mindless banter with Dunni. 10. New church: I made a decision earlier in the year to find a new church after my baptism. After church-hopping for a while, I finally found one close to my estate and I think I love it already. No, it’s not about the small chops I get to eat after service, it’s more like fitting in, at my pace without any pressure. I love that I could go where I’m a total stranger and vice-versa. 11. Roasted plantain and groundnut: I think it’s safe to say that it’s finally growing on my head. This snack sustained me all through exam period and LagosPhoto Festival. 12. Peace that passeth all understanding: It’s scary to be at peace even in the midst of adversity. 15. End of exams: it’s been such a trying(read difficult) semester, the worst – and I hope the last- in my entire college life and just so glad it’s over. 17. Ticking items off my checklists. I’m probably thankful a lot more things but I can’t seem to recollect every single one right now. Hopefully, as time goes on, I won’t forget as much anymore. A Few Of My New Favorite Blogs.